The Lower Modernisms – 020. Matchbook Delight! Part 5, Sambo’s Pancakes. June 27, 2011 by James Black. 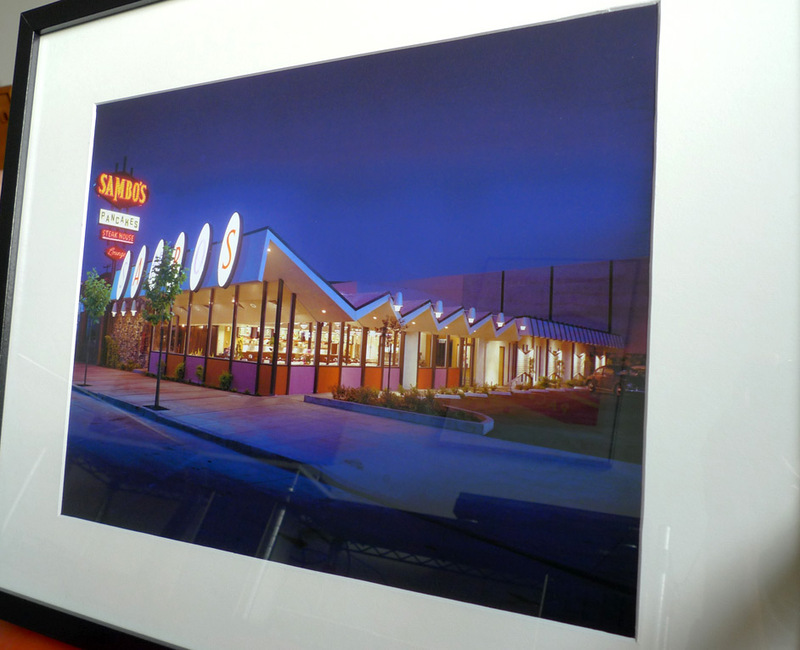 Though little remembered today, Sambo’s was a chain of coffee shops that rivaled Denny’s in ubiquity – there were 1,200 restaurants in 47 states as recently as 1979. The restaurants were named after its founders Sam and Bo, but their branding imagery derived from a turn-of-the-century children’s book called The Story of Little Black Sambo. Evaluating the implications of this racist imagery is beyond the scope of today’s blog post, but to me it seems likely that this imagery somehow contributed both to Sambo’s rapid growth during the 1960s and 1970s and to its even more rapid disappearance at the beginning of the 1980s. The cartoon imagery seen here is similar in style to that which decorated the interiors of Sambo’s restaurants, in cartoon-frame panels that told the story of how Little Black Sambo tamed some lions with a stack of pancakes or something like that. 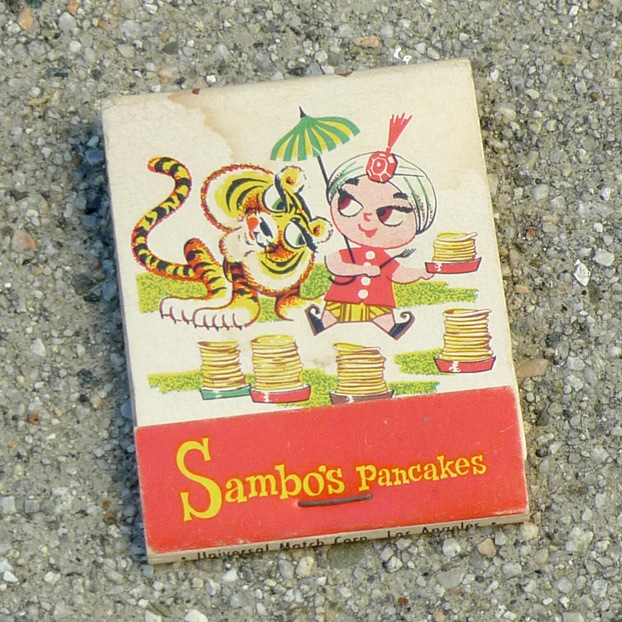 Emphasizing the yellow and red that figure so prominently in fast-food branding, the “Sambo’s Pancakes” logo is in a slab-serif style deliberately jauntified with letters arranged up and down from the baseline in a wavy drunken-master style. 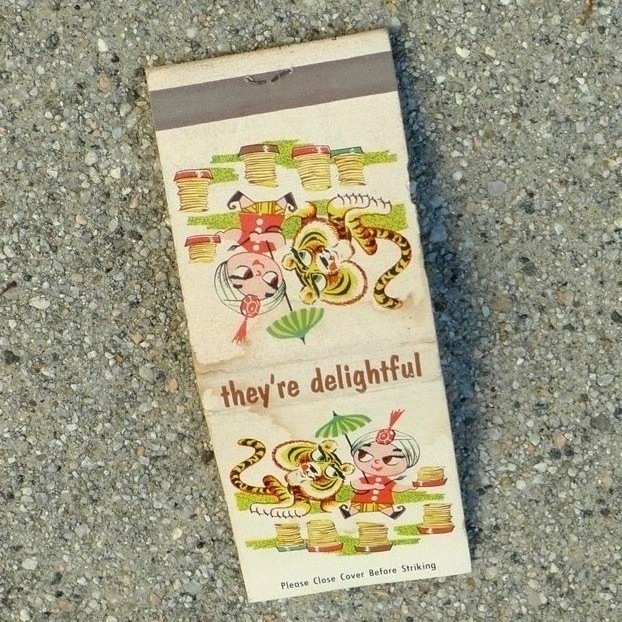 The reverse features the same image, but the spine, a part of the matchbook seldom exploited, reads “they’re delightful” in a nice signpainter style. Positively delightful! The building has definitely lost a lot of its original charm through remodels. Makes me wonder if all that architecture is still there, lurking underneath the peach and beige.